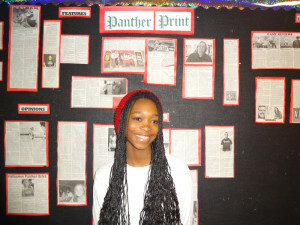 Jasmine Stovall is sophomore and a reporter for the Features section of Panther Print.This is her first year in journalism, but she is very enthusiastic and interested in the class. Jasmine has had a passion for writing for several years, and she loves interviewing people because she can easily spark up a conversation. In the future Jasmine plans to attend Ohio State University with a major in pharmacology and minor in English. In the near future she hopes to become a section editor for the Features section. Jasmine was recently a participant in the Palo Verde ROTC program and the unarmed drill team but decided to focus more on academics this semester. In her downtime, Jasmine plays several instruments, eats chocolate and attempts origami.